Once you become a certified nursing aide in a nursing home, you might often come across patients, who are helpless with their physical movements. These patients do not have sufficient stamina to get up from the bed, walk alone or go to the bathroom to urinate. In this case, the CNA who has given the charge of such patient will assist her to carry out these activities. One such responsibility of a CNA is to help a patient who cannot rise from the bed to pass the urine. The CNA has to help the female patient to pass out the urine with the help of a device, called catheter. A Catheter is a pipe made of rubber or plastic. It helps to pass out the urine of the patient from the bladder. The tip of the catheter tube is positioned inside the bladder with a balloon shaped structure. The other point should be adjoined with the plastic drainage bag. The plastic drainage bag is the catheter bag. It helps in collecting the urine coming out of the patient’s bladder. The tube and catheter must be cleaned every day under the catheter care process. It is a CNA’s responsibility to clean and sanitize them properly, so that the patient should feel safe and restful. Before starting the process, it is beneficial to know and remember these pointers. 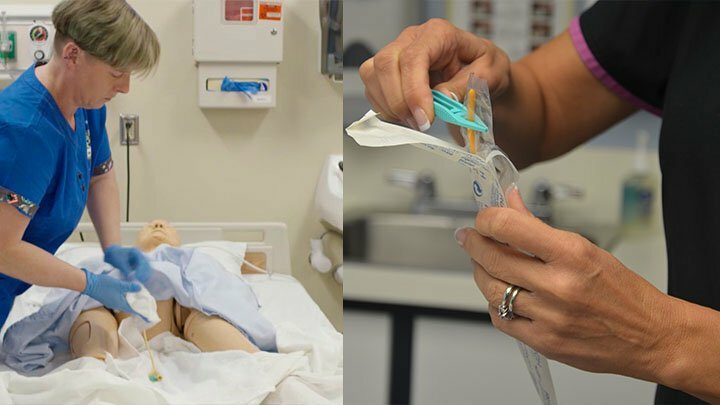 To provide the catheter care to the patient, it is vital for a CNA to wash hands well. Try to maintain a direct contact with the patient quite frequently. Converse with them in a slow and clear manner, as this will help them understand the instructions uncomplicatedly. During this entire procedure, take care about their privacy. Firstly, pull the curtains to obstruct the outside view and keep their body portions hidden whenever you can. Always check that you have brought everything required with you, before starting the care process. Do not begin the process without wearing hands gloves. The things essential to carry out the procedure are – 2 wash cloth fabric, 1 bath coverlet, 1 outsized towel and some warm water in washbowl. Greeting the patient graciously with a smile on the nurse’s face makes the patient pretty much comfortable to carry out the entire process in proper coordination. Introducing yourself to the patient and explaining about the catheter care process politely will also benefit you to gain their support to conduct the procedure. Make sure, you have worn the hands gloves to conduct the catheter care activity. This will help you to prevent from various infectious germs. The accurate warmness of water is also essential for this procedure. After filling the warm water in the water bowl, you must allow the lady patient to decide by touching the warm water, whether its heat is appropriate for her or not. In case, if she cannot do this, then you should ensure it for her. This is necessary for you to conduct the whole care activity with ease. Adjusting the height of the bed as per your easiness will let you do the catheter care activity of the patient in an accurate manner. Now, place a linen protector sheet on the bed linens, under the patient’s perineal area. This will avoid the infected content from declining directly on the linen sheets. To lay the protector sheet, you may turn the sick person to one side and spread it properly. You can also pick up their legs a bit and then put the sheets under the perineal portions. To unclothe the patient’s body for catheter care is imperative. However, always be sure that her other body parts should not be uncovered unnecessarily. Now, apply some soap on the wet wash cloth and without pulling the catheter, hold it very much closely from the meatus. You have to start the cleaning of the tube by holding a minimum of 4 inches from the closest possible area (meatus) of the tube. Make sure, you do the cleaning in a single direction. Start it from the meatus part and expand it outwards. Always use a clean and different segment of the washcloth for every stroke of cleaning. During this course of action, whenever you find that the fabric becomes unclean, take a fresh one in use. After the cleaning of the tube is completed, now you have to dry the catheter tube. Now, again hold the catheter tube nearby the meatus without any tugging. Starting from the nearest possible portion (meatus) of the tube, dry not more than 4 inches of the tube. The direction is same for drying, as well. Begin it from the meatus and extend it outwards. Make sure, while drying also you use a different and clean portion for every rub. Change the cloth every time, when it becomes soiled with a clean one. Now, you must take away the linen protection sheets along with linens and dispose them. Keep them in a suitable receptacle. Always keep the soiled linens away from coming in the direct contact of the patient’s clothes. After, you are done with the rest of the procedures, do not forget to lower down her clothes and cover the perineal part of her body. You may take a clean blanket or a light sheet to cover up her body. Unfilled the wash basin, clean it properly and let it dry. You have to perform this activity in the disposal area and keep the equipments for disposal, which you have used in this process. After removing your hand gloves; it is essential for you not contaminate yourself. Therefore, essentially wash your hands in an appropriate manner and keep them sanitized. Even if, you have done the catheter care activity with all your attention, still, it is your duty to ask her about the comfort, before you leave her room. If she is not, then you have to aid her to take in a relaxing position. Also, be sure that you have kept the calling push button within her reach. You also must check whether you have brought the bed back to the appropriate level or not. What does the evaluator notices when you execute this skill? 1. Do you commence the activity with the proper steps? Tip- Washing your hands and greeting the patient are the key activities, which you must do in the beginning. 2. Do you let the patient check and decide the warmth of the water? Tip- First, let the patient decide the water temperature. If the sick person is not in a mental status to do that then, you must do it, as a substitute. 3. Do you maintain the privacy parameters of the patient? Tip- Always take care of the patient’s physical privacy while conducting this activity. 4. Do you put the protection sheet before beginning the care process? Tip- Spread the protection sheet properly under the patent’s perineal part, prior to starting this activity. 5. Do you hold the meatus appropriately, during this entire cleaning action of the catheter? Tip- While rinsing, cleaning or drying the catheter, it is significant for a CNA to hold the meatus from the closest possible point with care. 6. Do you clean and dry the catheter accurately? Tip- You must unsoil and dry at least 4 inches of the catheter tube with every single stroke. 7. Do you use the washcloth aptly for the cleaning? Tip- You must use different portions of the cleaning cloth for every single wipe of cleaning. 8. Do you use various parts of the washcloth for every swab of rinsing? Tip- For every wipe of the rinsing also; you need to use different parts of the cloth. 9. Do you make use of various segments of the cleaning cloth for drying? Tip- You must also use various portions of the cloth for every swab of drying. 11. Do you perform the end activities accurately? Tip- It is essential for you to conduct the activities accurately at the closing stages of this process, as well.